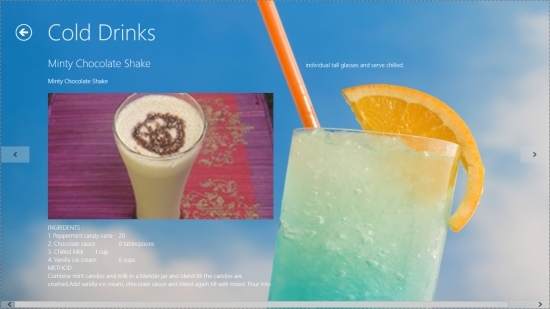 Cold Drinks Recipes is a free Windows 8 Recipe app that offer recipes of some amazing cold drinks to keep you refreshed. With summers arriving soon, you might also like to enjoy flavoured cold drinks as everybody does. However, the usual cold drinks available in the market contain soda that is harmful to your health. Cold Drinks Recipes app provides recipes of some amazing cold drinks that are healthy, tempting, and very refreshing. This free Windows 8 recipe app offer recipes of drinks like healthy juices, yummy shakes, and fruit punch that you can easily be made at home. 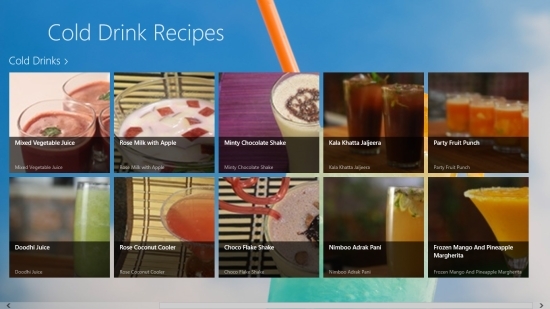 Cold Drinks Recipes app is freely available in the Food & Dining section of Windows Store. To view the app directly in Windows Store, you can click on the link given at the end. Let’s see how you can access recipes from this free Windows 8 recipe app. Cold Drinks Recipes is an extremely simple app. To access these wonderful cold drink recipes, all you need to do is to install the app on your Windows 8 PC. As you launch the app, you will see the main screen with a beautiful tiled interface displaying pictures of various cold drinks along with their names. Click on any tile to open it. A nice picture of that cold drink will be displayed on the next screen. You will also find the detailed list of ingredients and stepwise method of preparation of that cold drink. Use left and right headed arrows to navigate through various cold drink recipes that the app offers. The back arrow button placed on the top left corner of the screen will take you back to the main screen. Cold Drinks Recipes is a nice free Windows 8 Recipe app to learn recipes of different types of cold drinks which are ‘good to have and easy to make.’ But the app contains a limited number of recipes. It would have been better if this app had more recipes of cold drinks. Give it a try and share your feedback via comments. Get Cold Drink Recipes here!